Notes: Headline show. 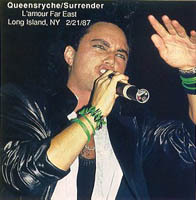 The band "Surrender" opened for Queensryche. Songs played by Queensryche (order not confirmed) included "The Whisper," "Chemical Youth," "Neue Regel," "London," "Roads to Madness," "Take Hold of the Flame," "Blinded," and "Queen of the Reich." This was Queensryche's last show on the Rage for Order tour.